It was already after dark Friday night when we pulled into the Lonestar Preserve, Louisville Grotto’s gem in central Kentucky. I was happy to get out of my hometown for Memorial Day weekend, as a larger event than the one I was attending was gearing up to occur: the 101st running of the Indy 500, taking place just walking distance from my house. While the race day celebrations are fun and my neighborhood appreciates the revenue, the approximately three hundred thousand people (not including the ones hanging out but not attending the actual race) that appear are a little much for my taste. So we loaded up for the three-hour drive south and fled to a different event, Speleofest. Attendance here numbered in the hundreds instead, but the camping area was a smaller version of the scene playing out a few hours away in the Coke fields. There is no reference to drug lords there, if the term is unfamiliar; it is simply the main camping area for the Indy 500, owned by Coca-Cola, encompassing an area that stretches a mile across by another half mile at its longest point. Every year in May, a tent city springs up in the field, dotted with parked vehicles and parties, with crowds of people flowing through like the tides. This was no different, except for much less need for the crowd control measures that are a given at the race. Although cavers are a strange lot, the passion that unites us in subterranean exploration also encourages us to maintain the land and the community, and it’s a distinct bunch that heeds the call of underground. I’ve caved with sewer workers and CFOs, doctoral recipients and dropouts; and this weekend, I found myself in a microcosm of that world, passing around a bottle of moonshine and another of Wild Turkey in a group of friends hailing from all over the region. 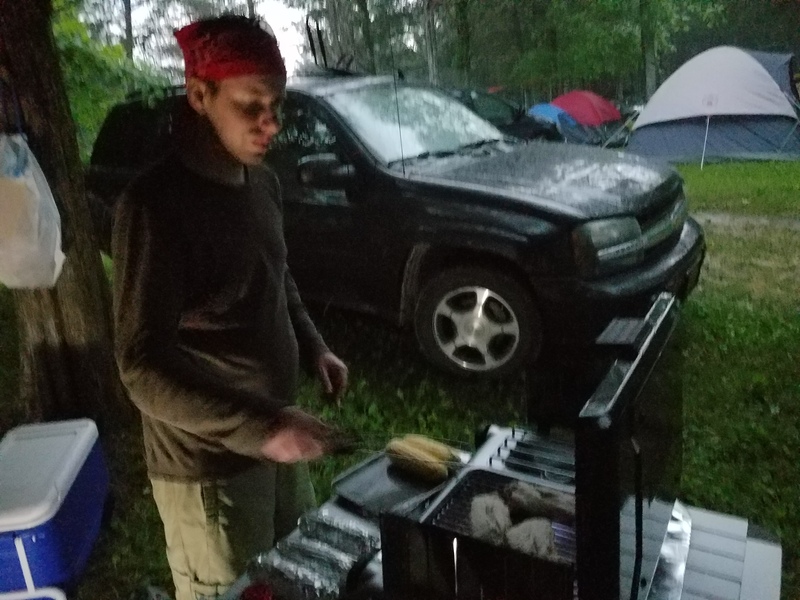 George, originally from Romania, had driven down from his home in Chicago and slept in his car; others came from Alabama, Tennessee, and Ohio, and we sat in our camp chairs under a tarp rigged up against the rain pattering overhead. A band was playing at the pavilion down the way, and when they finished, a radio. The music drifted up, punctuated by cracks of thunder and lit by an LED lantern hanging by a carabiner from the climbing rope that held the tarp in place above us. That was the second night, when the moonshine came out, and we all had stories to tell about our day’s successes. Carl had originally been on the roster to lead a trip to Bland Mill Cave, but due to the weather and propensity for flooding, his trip was cancelled. So instead we signed ourselves, Arwyn and Ali up for a trip to Glass Cave that morning, after which Arwyn continued on with the group to a second cave, Robert’s Hollow, and the other three of us returned to camp. Glass Cave was a photo trip, with the hardest part being the hike to the cave mouth from the cars, but the late drive in had exhausted Ali, so we bundled her into the tent for a nap, each grabbed a beer, and sat down to check out each other’s pictures. Glass Cave, to me, was a cave of faces. The cave was dominated by an enormous formation room, highly decorated with soda straws, crystal pools, and rimstone dams that weave and overlap as if designed by MC Escher, at the foot of great columns that bear melted, roaring visages better attributed to Salvador Dali. Water dripped from the ceiling in rivulets- the growth process at work- the speed of which, flowing over time, created the fantastic shapes that appeared out of the darkness around us. 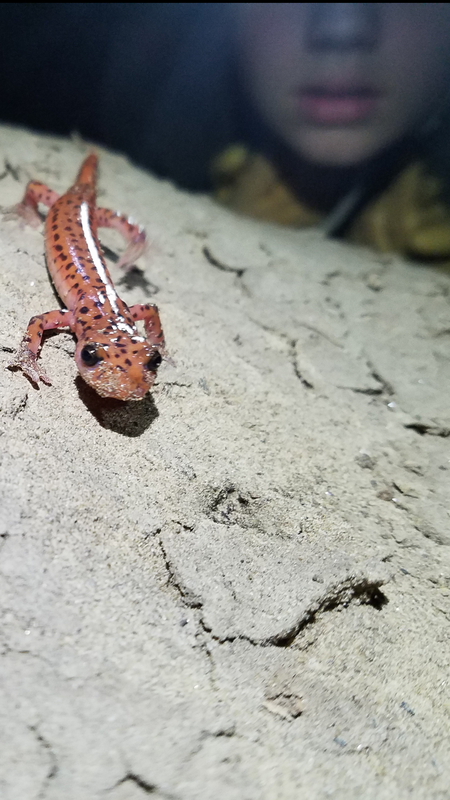 The second cave was apparently similar, although the formations were dead, and Arwyn was able to score a praiseworthy salamander photo, which I couldn’t help but copy here (with permission). 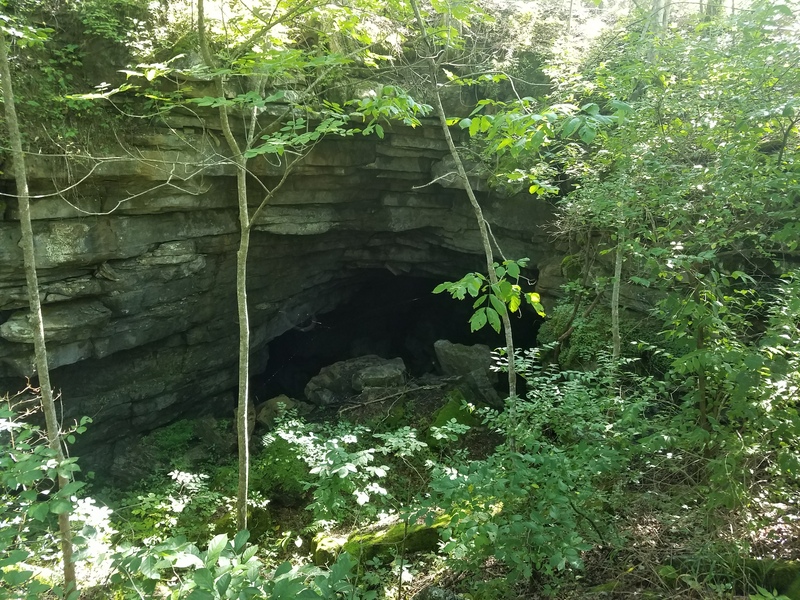 Other caves that were visited included Roppel, McCamish Crystal Cave and Floyd Collins, named after the legendary Kentucky cave explorer who died in 1925 after becoming trapped in a cave. Born in 1887, Collins would have been about six years old when Nicola Tesla and Thomas Edison were battling for the chance to show off their respective electric light models for the 1893 Chicago World Fair, and he came of age during the Kentucky Cave Wars, a period in the early 1900s dominated by an interest in commercially developing the area’s numerous caves as tourist attractions. 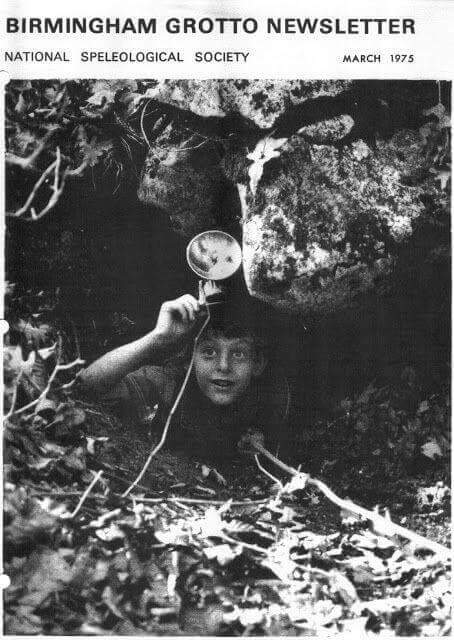 It was for this reason, coupled with his thirst for adventure, that Collins was in Sand Cave that fateful February day, when a dislodged rock trapped him in the crawl that he was exploring. Rescue efforts went on for two weeks, but ultimately failed. This story serves to illustrate the inherent dangers of caving, where errors can be fatal, and the cave was finally closed to the public after being purchased by Mammoth Cave National Park in 1961. This trip, therefore, was particularly special, due to the associated history and the rarity of being able to enter. 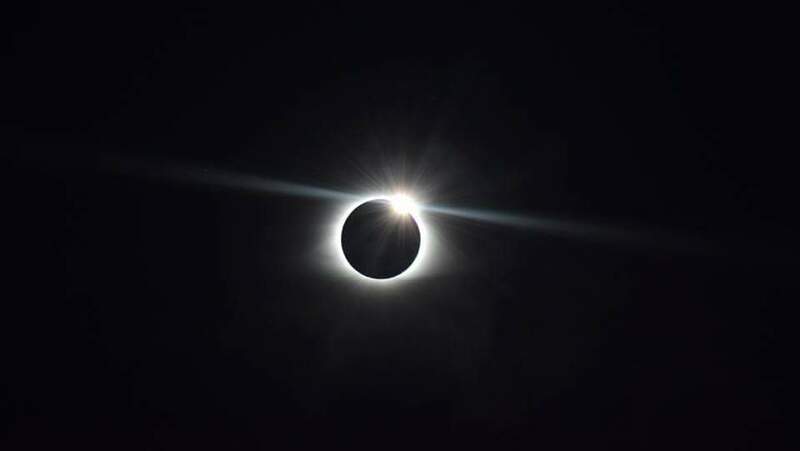 The group was determined by a lottery, and while some friends were able to attend, we did not get chosen; they brought back stories though, and pictures of gypsum-encrusted passages and gravity-defying helactites that twist in every direction. As opposed to stalactites and stalagmites, which are formed of calcium carbonate deposited by dripping water, helactite formation is a product of pressure rather than gravity, as the same mineral-rich water is pushed through pores in the rock in tiny droplets that linger on the surfaces of the cave. Over time, these droplets leave their own deposits, which build up slowly upon each other, following the path of least resistance in whichever direction it may be, resulting in gorgeously curlicued formations. Talk soon turned to the old days, at which point I took another swig of whiskey and leaned back to listen. 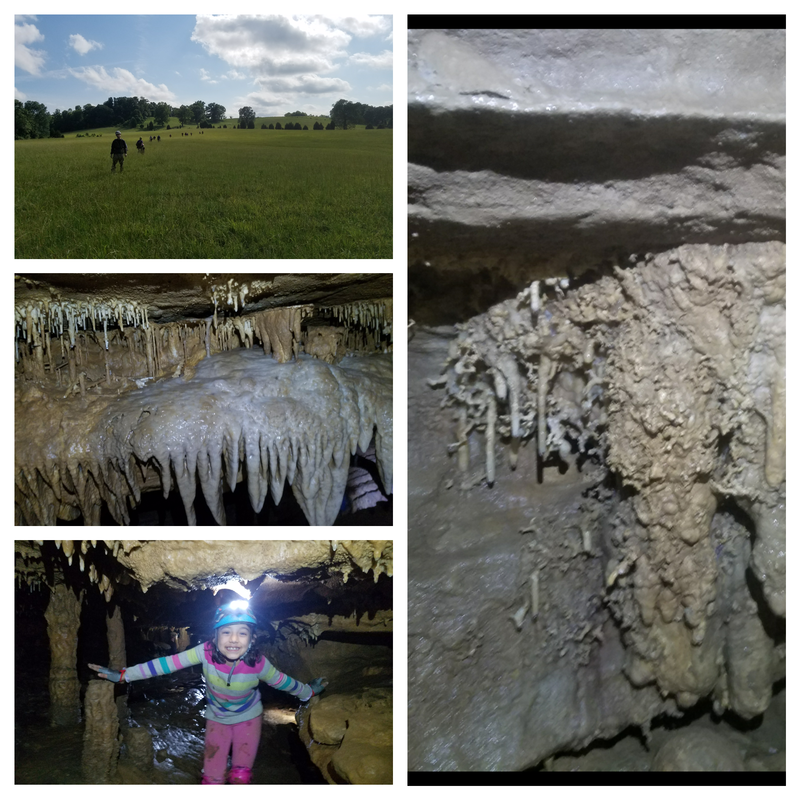 With not even a year of caving under my belt, I had nothing to contribute, but that didn’t make the conversation any less fascinating, especially with my love for history and interest in the evolution of cave exploration. Steve “Squirrel” Warren and Fenn Spencer, with nearly a century of experience between the two of them, began to reminisce about the days of carbide lamps. Fenn was raised by caver parents and at thirteen years old, was already descending into pits hundreds of feet deep under that very same type of light. Designed with two chambers, the lamps contained calcium carbide in one and water in the other, which would drip into the lower chamber and produce flammable acetylene gas, which is then ignited to be used as a light source. With an open flame on top of one’s head, being on rope becomes a more complex task, as burning the rope could easily end in injury or fatality. The climber would have to lean away from the rope to avoid any such occurrences, requiring a much less centered posture than what can be accomplished with the equipment now. Even with that in mind, there were still instances of rope getting singed, and Squirrel, a grizzled cave veteran hailing from Jasper, Tennessee, spoke of instances of looking up to see the rope smoking as he rappelled. This problem became obsolete with the eventual switch to electric headlamps; some (albeit few) cavers still use carbide even now, though, as it gives off a different quality of light, softer than the harsh illumination of electric. The moonshine soon made another round as we sat in the light of our electric fire and the talk continued well into the night, the group finally breaking up around 3 a.m. to sleep and prepare for more caving in the morning. Ali and I joined a group heading to Raymond Cave, a repeat for us, but one well worth it- the staggering amount of crystals that capture and fracture the light in all directions led one of my companions from the previous trip to remark that he felt like he crawled through a geode. An accurate statement, as long as it’s noted that the geode also contains waterfalls, copious flowstone, a pit, and gorgeous canyons that cleave the passage in several points of the cave. Helactites adorn some of the walls and soda straws protrude from overhead in a display made even more amazing by the thought of their slow formation, a drop at a time. Raymond was the last of our weekend’s adventures, and after camping one final night, we said goodbye to our friends and headed back to Indianapolis. My interest was piqued, however, by some of the stories that had been told and even more that had been alluded to on Saturday night, so I reached out to Fenn, Birmingham’s child prodigy, now an adult, to learn more about what that was like. 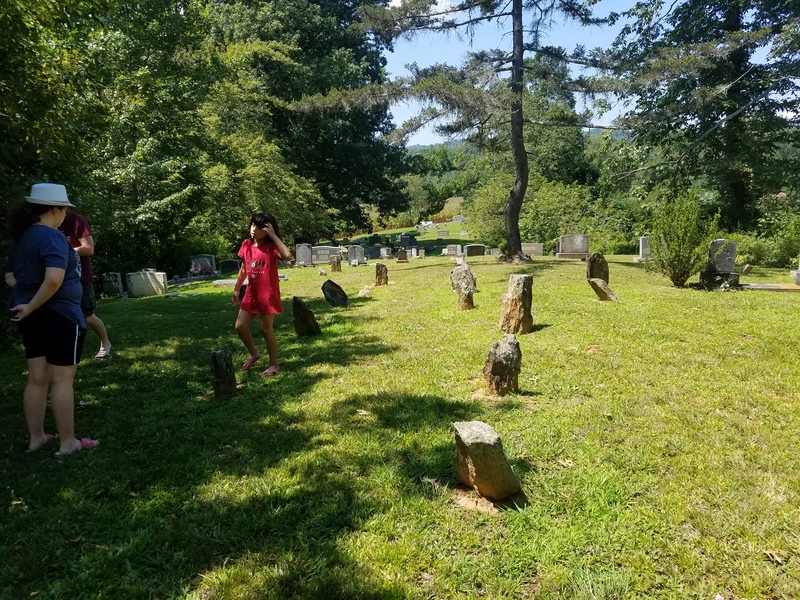 Kathy was named for her maternal great-grandmother, a herbalist in rural Alabama who used her knowledge to serve as the family’s doctor in the late nineteenth and early twentieth century. More than just the name, she inherited the appreciation of nature as well. 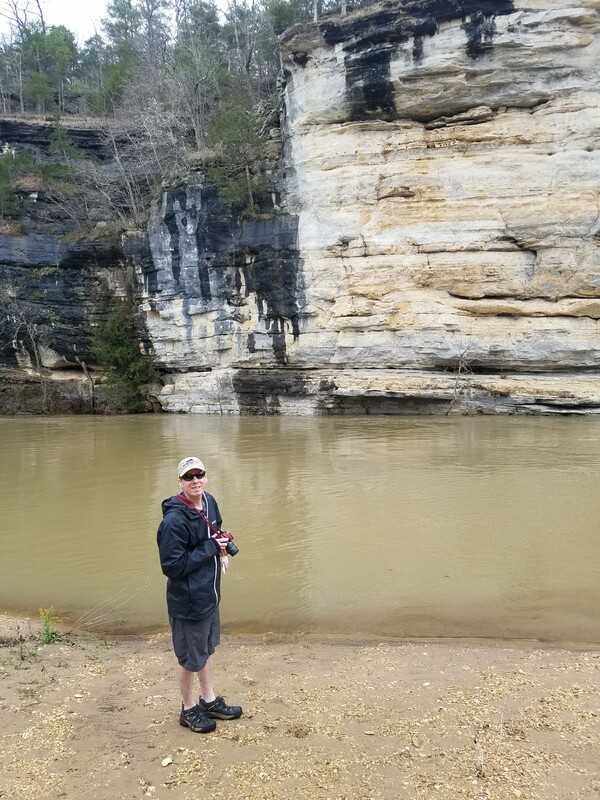 Her first caving experience was in 1965, while five months pregnant with her son; as she told me, she was tired of sitting around the house and decided she was going along on a trip to Alabama’s Lake Purdy Cave that her boyfriend at the time was attending. She said he knew better than to argue, and provided her with equipment. She emerged from the cave a “muddy wet monster” and was hooked. “I wasn’t interested in the vertical part, seeing who could go farther or longer,” she said. 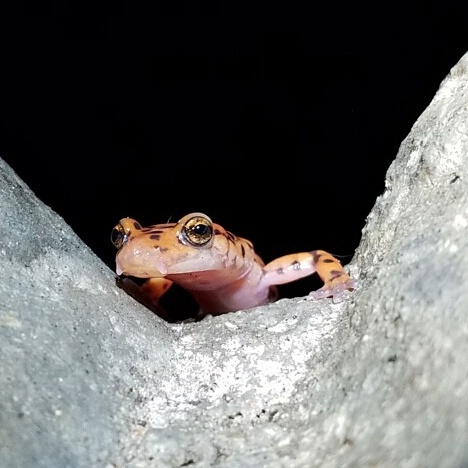 Her interest was in the cave life and her moment of epiphany came upon seeing a clutch of transparent salamander eggs with the tiny baby salamanders, near hatching, swimming around inside. “It was like seeing the past, present, and future all together,” she told me. Not much later, the first Earth Day was declared in 1970, and she understood conservation to be her calling. At this point, she had been caving with her young son and his father, Steve Spencer, for about five years and was shaking things up for the Birmingham Grotto. Established in 1958, its constitution included a clause that women could not join. The reasoning, she told me, was that if a woman were to be trapped in a cave overnight with her male counterparts, her reputation could be compromised, and her purity called into question; by the early seventies, however, Kathy had gotten this bylaw removed and been nominated for the Grotto’s presidency, winning by a landslide. Other archaic ideas remained, though; as an adventurous young mother, she had heard that “sons of assertive women tended to be gay,” and when her presidency was announced, a male grotto member stood and questioned the decision on the basis that she would “get crazy once a month.” She wrote off the comment as tongue-in-cheek and still secured the presidency but it was an indication of the times. Fenn, now 51 (and still not gay), is a proponent of opening up the caving world more to women; changes have undoubtedly occurred since his mother’s introduction to it, but he still sees instances of distinctions being made. In vertical caving, for example, he commented that “they’ll teach women to climb, but not to rig, so when it comes down to it, you still can’t go without a man.” He shook his head, and took another shot of whiskey to cure the gloom. That said, it’s not all bad; he acknowledges that improvements have occurred, and as a woman, I can personally say that most cavers I have met have been generally supportive. After forty years of caving, he suggests that he may be nearing the end of his underground career, especially after a neck injury a few years ago. Even so, he is still enthusiastic and involved in the community, reaching out to the newest generation of explorers with a message of conservation and equality within the subterranean world we love. Says Fenn, “People are like caves. Some hard and ugly, some soft and pretty, some make you work for nothing, others make all the work worthwhile. We awoke tired and sore Tuesday morning at the Erbie campsite, halfway through our planned trek. The four of us were backpacking, and the trail to the next site, Ozark, was supposed to be both shorter and easier than the previous day’s hike, which had topped ten miles, and whose elevation gain was somewhere in the four digit range- the guidebook listed eleven hundred feet, but did not include our jaunt up the Kyle’s Landing road, which added another 350 feet of elevation gain at a 10% grade. Erbie to Ozark was charted at less than seven miles with only about three hundred feet of gain throughout; unfortunately, though, we were fated not to make the hike. While Carl and I had been setting up camp the night before, Arwyn had told us that her shoe was torn, which we had brushed off for the time to focus on other matters. By the light of day, though, we could see that one sole was completely detached, and the other not far behind. Duct tape and paracord can only postpone the inevitable, and with blisters already on her feet, we made the decision that she would not be hiking that day. While it may be easy to decide not to hike, there were logistical problems that had to be resolved. In the midst of a National Park, neither my AT&T nor Carl’s Verizon could pick up a signal to change our itinerary and have the Jeep dropped off at Erbie. 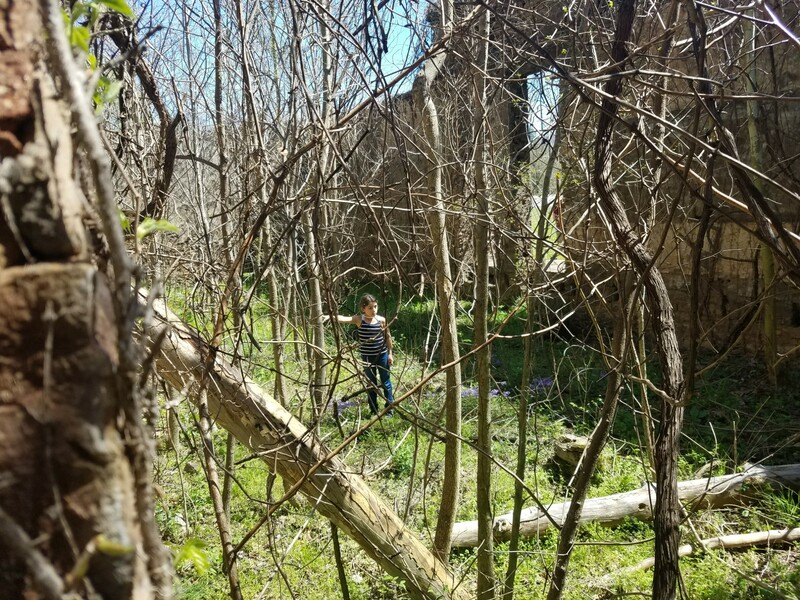 Carl walked the campground, Ali tagging at his heels, looking for a payphone or cellular signal, but there was nothing to be found. Although we had all breathed a collective sigh of relief at taking the day off, we were now stuck in what Carl dubbed “the worst campsite ever,” with not even a decent view to distract us. We had begun to toss around the idea of him or I hiking on to Ozark alone while the other stayed with the kids and coming back with the Jeep, but we were reluctant to split the group, and both of us wanted to be the one to hike on anyway; eventually we suspended the discussion without making a decision and I went to make another lap of the campground to look again for a phone as well as to find a water spigot and refill our Camelbaks. I passed an older man near a campsite as I searched, who exclaimed his surprise at seeing a fellow human being, and I laughed politely and walked on over to the campground message board, hoping to see water and a phone marked in the map. They were not, of course, and as I stood there, the man who had spoken to me came over and began to chat. He was down from Minnesota with his son’s family in a couple pickups and an RV trailer and they had come in late Monday night. I was apparently the first person that he’d seen that wasn’t related to him since they’d made camp, and he was the gregarious sort who longed for a new friendly ear. We shared that moment of solidarity for our respective family vacations and I began to tell him about mine. His face turned sympathetic when I recounted the discovery of the rebellious shoe and he offered to give us a ride out to Ozark, as long as his son was okay with the idea. It turned out that he was- they had intended to camp at Ozark the night before instead so they could see Ozark’s bluffs, but couldn’t find the turnoff and ended up at Erbie instead. They wouldn’t mind at all going to see it. I hustled back to our site to break camp. We tore down in record time, returned, and threw our gear in the back of the indicated pickup. The old man smiled at Arwyn, still fretting about her shoes. And the girls both chimed that it sounded way too cold, and incredibly, as soon as the subject of that frozen giant to the south opened, it was slammed shut and the conversation changed and then ended as the packs were settled, and we said our goodbyes to him and crammed into the backseat for the bumpy ride up the Erbie road toward Ozark. The son and his wife drove us, and their children and grandpa went off in the other truck and out of this story. We made small talk, the kind the comes with the realization later that you actually learned nothing about them. Something about Minnesota weather, perhaps, but nothing of Minnesota dreams. We arrived at Ozark and our good Samaritans, ready to head home, only spent a few minutes at the shoreline before saying their goodbyes and getting back on the road; with our Jeep still not delivered, we settled down at the nearly deserted campground to spend a lazy afternoon napping and playing on the shore. The Ozark campground, much like Kyle’s Landing, boasts impressive bluffs looming just across the river. The bluffs are formed by mainly sandstone and dolostone, combined with some limestone, deposited during different geological periods, namely the Mississippian, Pennsylvanian, and Ordovician, the last-named layer being deposited nearly half a billion years ago, when the land we know was sea and the landmass called Gondwana was breaking up and beginning to head toward its modern locations, creating distinct places such as the Himalayas and Antarctica. 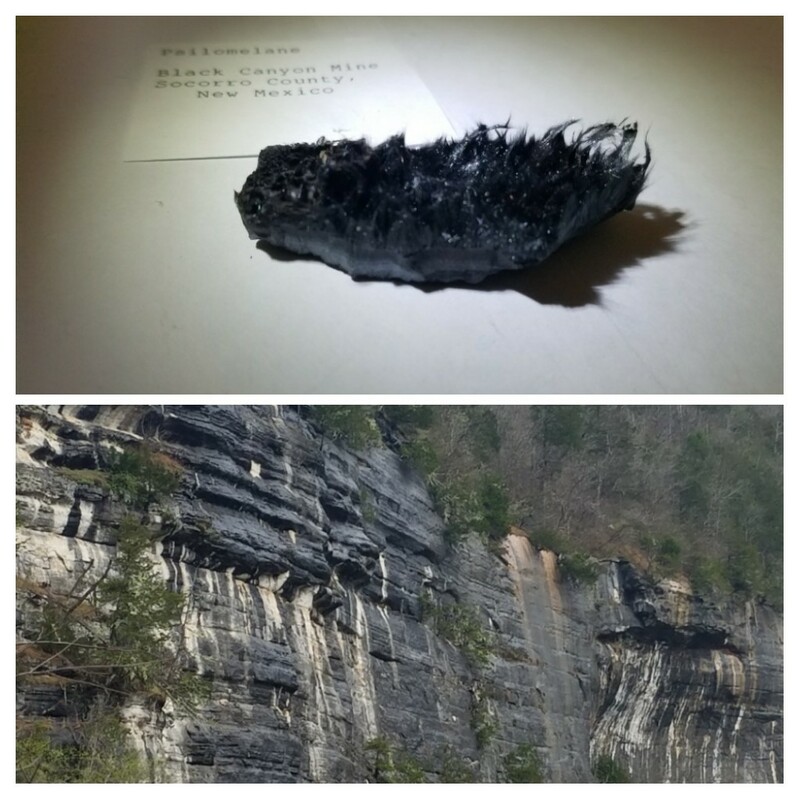 As we gazed at the bluffs, we were particularly interested in the black stains that ran down the rock, similar to others we had noticed elsewhere in the region. After further research, I found that the staining of the bluffs, or “painting” in the local parlance, is caused by a precipitate of manganese oxide, carried by water that has seeped out of the rock. Manganese, an element used in metal alloys, not only has its uses in industry, but it is exceedingly valuable in nutrition too, helping the body to process and use the vitamin thiamine. It is also beautiful. Manganese oxide, also known as pyrolucite or psilomelane, can create fern patterns on sandstone that nearly appear to be fossils, or it can alternately form what is referred to as “rat’s hair,” delicate tufts of pyrolucite fibers that protrude from the surface. Gorgeously painted bluffs, like the ones that stood before us, were but another effect of the mineral. Ozark thankfully also had the fine feature of a phone, and we were able to call and revise our arrangement for the Jeep, which arrived late in the afternoon, delivered by Buffalo River Canoes. We had initially planned for it to be at Ozark on Wednesday, but to our delight, they were able to deliver it early. Our first order of business was to get a room and a round of showers. We were all sweaty and not a little dirty, after an afternoon in the sand with no cover from the sun and the previous day’s hike. This turned out to be easier than most of our trip up to that point: we’d rented a cabin in Jasper at the Arkansas House which was supposed to be ours the following day but it was empty and clean so we were able to check in early. The proprietor was friendly and immensely talkative, with a story for everything; I happened to be wearing a Jack Daniels t-shirt that day, and he launched into a tale that made me think of an old 19th century merchant mariner, spinning a yarn behind his pipe and cup of grog. Perhaps in another life he’d been a whaler alongside of Ahab, or fought under Jean Lafitte during the pirate’s legendary display during the Battle of New Orleans, or maybe a member of some other ancient armada. Whatever the case, the old man’s eyes softened with the mist of memory as he began to speak, undoubtedly reciting a tale that he’d heard since infancy. “Like here,” I said. We stood in the Great Room of his inn, decorated with chandeliers and antiques. The far wall was dominated by a large painting of fully-rigged sailing ships, their canvas tight with wind, which served to intensify the unreal effect. On a map, you would have found us in Jasper, Arkansas, the county seat of Newton. He beamed at me, obviously pleased with his tale, and a good one it was, although it could not be true. Washington died half a century before Daniels was born, but it didn’t matter; the story was a myth of the Ozarks with as much flavor as the whiskey in question. 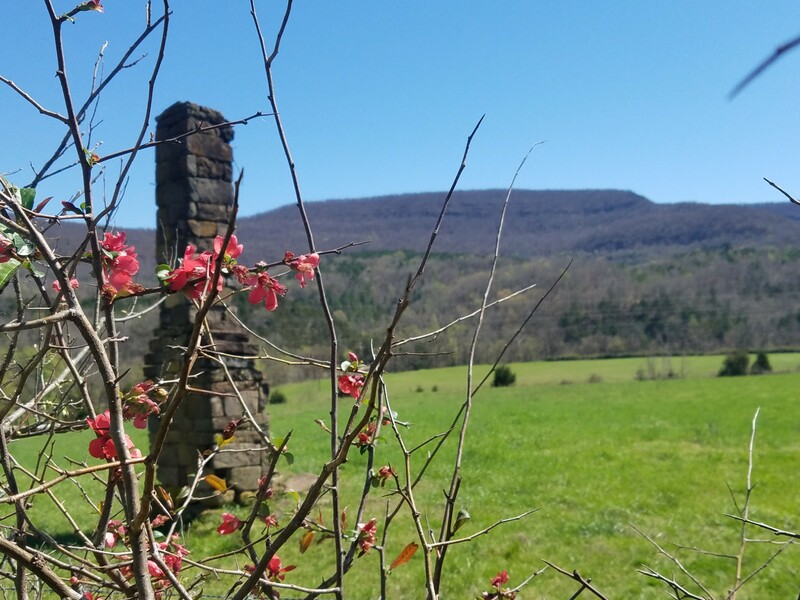 We spent the rest of our stay exploring Newton County and the surrounding areas, with our cabin serving as home base; multiple times we set out in the Jeep in different directions, just to see what we could discover. One day we headed toward a town called Vendor and the mountain vista was interrupted by ruins, few but stark, of the old town- an ancient chimney rose over a meadow, another on the other side of the lane that wound down into the valley, and further on we came across another structure that had survived more than whatever had bore the chimneys- we couldn’t quite decide if it had been a one-room schoolhouse or if it had been a small church, but by this time all that remained were the mortared stone walls and facade, overrun with vines and other growth. I attempted to find some more information on Vendor’s history, but there was not much to discover without having stopped in town to try to talk to locals. 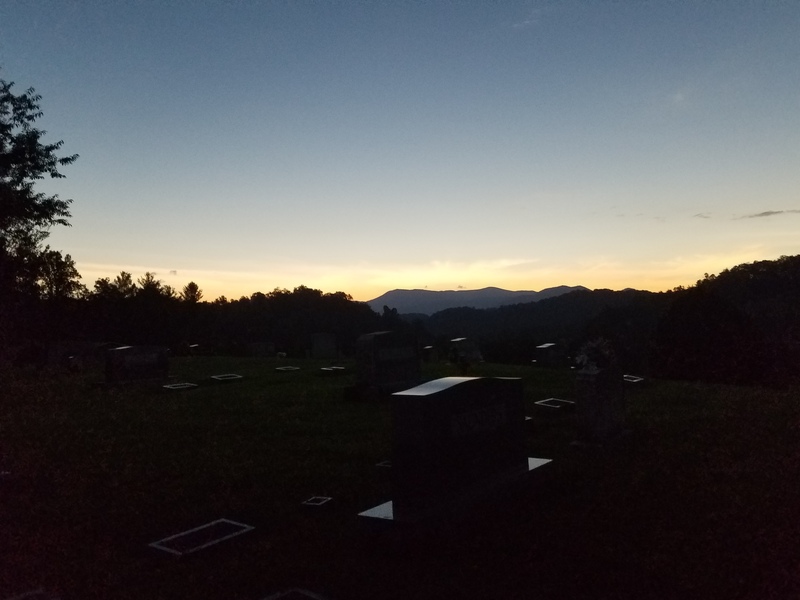 I found cemetery records going back into the mid-1800s through the Newton County Historical Society‘s website and an anecdote on Wikipedia about the name, saying that it came from traveling salesmen setting up by the road in the area. I struggle to accept Wikipedia as a source, but with no others to be found, I must admit that it sounds reasonable, especially as those aforementioned cemetery records contained no surnames of Vendor. It should be taken like the tale of Jack Daniels and the American Revolution- a story, no more and no less. It can be so easy to get carried away by the tide of imagination in trying to discover history, so I will stick to the facts: Vendor is a hamlet of perhaps two hundred people, not far from the Scenic Byway 7. As for what I can imagine, those people each have lives and petty grievances and dreams and ancestors, and those ancestors left those artefacts that linger in those fields to tell the story of a tiny backwater that is fading away. Maybe after leading the young United States to victory near the end of the eighteenth century, the very premature Mr. Daniels then set out for the county whose name he carried to establish a school. Maybe in such a place, we should just revel in the fictions, as closely held are the facts. There was only one storyteller that we encountered who disappointed me. 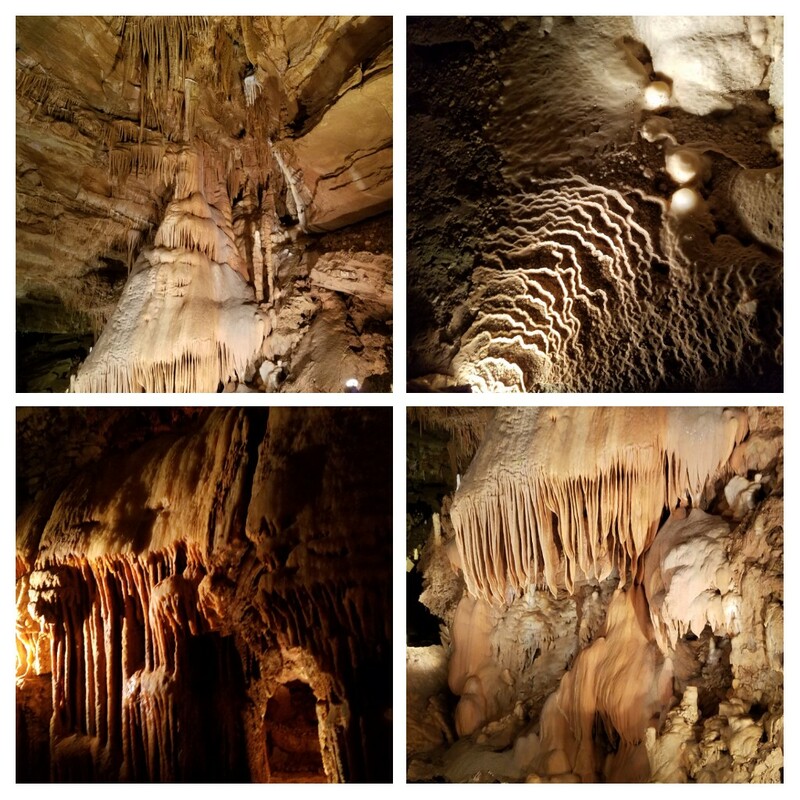 Driving from Harrison to Jasper, we noticed signs for a show cave called Mystic Caverns and at Arwyn’s request, we made a stop on Wednesday to check it out. 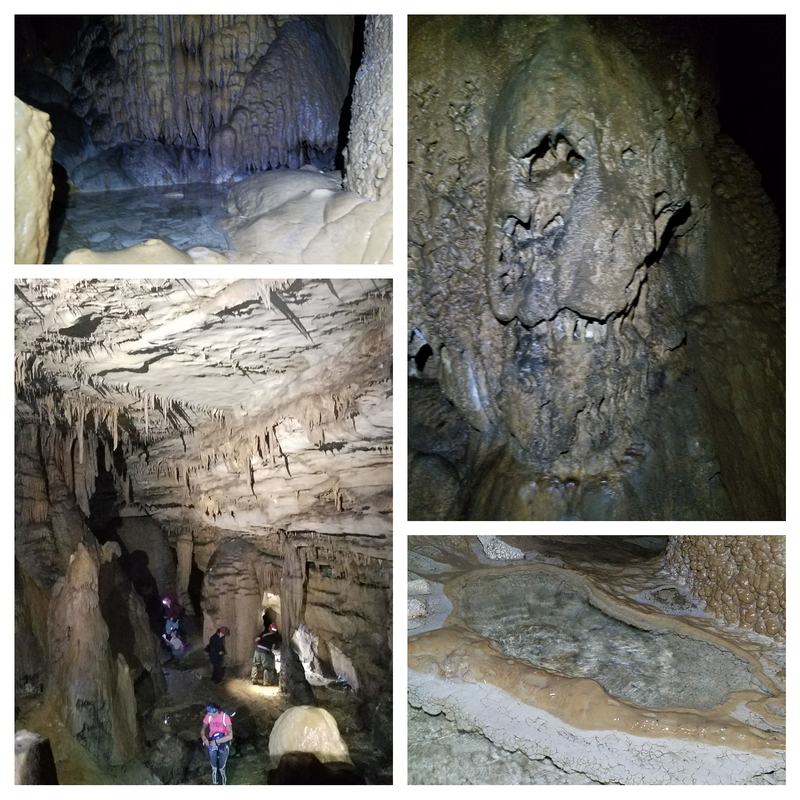 We bought passes to Mystic and its sister cave, Crystal Dome from fresh-faced youngin named Joey, who turned out to be the guide for the tour as well. I don’t think he liked us from the beginning. Admittedly, we can be a little silly sometimes and have been known to ham it up on occasion, such as when Joey the guide asked for someone to sing in one part of the cave in order to demonstrate the acoustics- we volunteered Carl, and the guide’s eyes flickered around the room for alternatives. Nobody else volunteered. He reluctantly selected Carl, who bounded up to his appointed stage and belted out the jingle for his fictional product Snake Leash, accompanied by my hysterical laughter and Ali sweetly singing along. We can also come across as pretentious, especially where caves are concerned. The girls love to brag about their underground accomplishments and this occasioned no exception; considering their ages and accomplishments, the pride is well warranted. 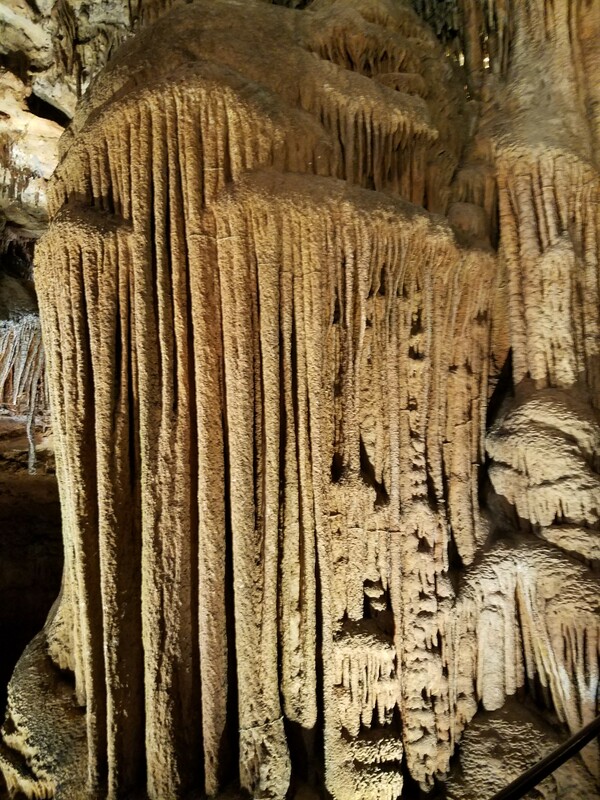 I don’t know if young Joey rolled his eyes at them, but it would have fit well with his attitude, and this was what underlaid our fundamental difference: our pretention is that caves are fantastically beautiful things that are worth exploring, understanding, and protecting, while for him, it was clearly just a job. 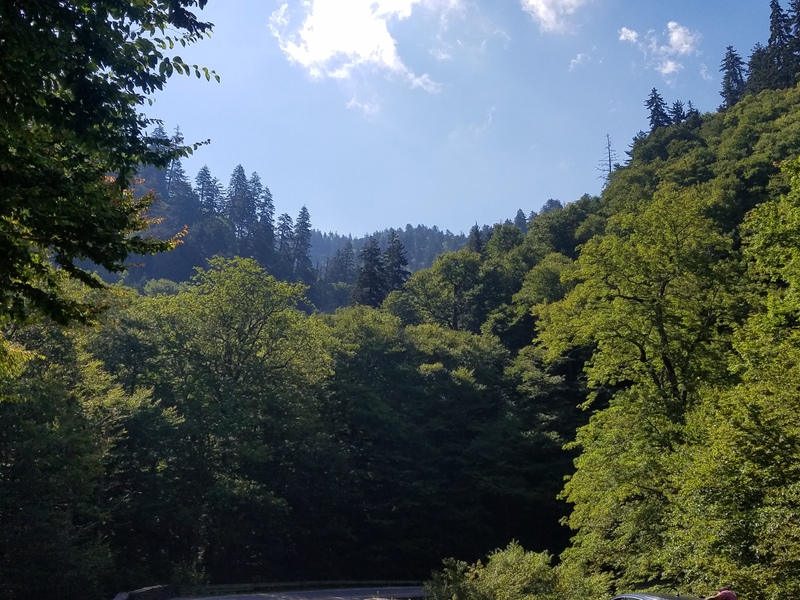 While navigating the switchbacks of the mountain roads one day, in our perpetual awe of the area, Carl and I talked about how wonderful it would be to have those views from one’s own house, and he mused about what a shame it would be to become jaded with such a place. That was the impression I got of our guide- maybe he was thinking about the upcoming weekend, or something going on at home, but he showed little interest in the beauty around him and was not receptive to our questions about the geology of the cave. He had a script, but knew little behind it. Arwyn asked how old the cave was and he said that he didn’t know, and furthermore that there was no way to tell. She suggested that the formation growth could give us an idea, but he was quick to point out that different factors could affect growth. True, but can’t it be estimated? “There’s just no way to know,” he responded, taking refuge in the safety of negation. 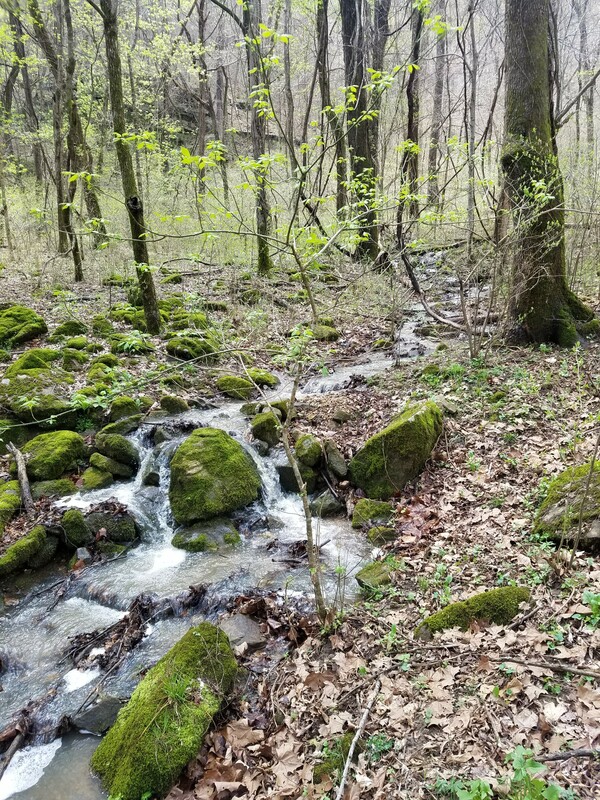 We were deprived of its history, so I’ve taken it upon myself to find another story of the Ozarks, one that is more ancient, dating back to the formation of the land itself. According to geological maps, the area is on the edge of the Springfield Plateau, made of rock deposited during the Mississipian Period somewhere around 320 million years ago, back when Arkansas was covered by a shallow sea. And while it is true that different factors affect formation growth, such as outside temperature and amount of rainfall, estimates can be made for annual growth ranging from .13 millimeters to up to 1 or even 2 millimeters. The main attraction of the cave is a gigantic formation called the Pipe Organ, reported varyingly at 28 to 36 feet tall. This definitely complicates the issue of estimation, the math allowing the wide window of four to eighty five thousand years. Even if we go with the lower end of the estimate, that would mean that the Pipe Organ was already beginning to form, drop by slow drop, while the first human civilizations were amassing, the pyramids were being erected in faraway Egypt, and the Olmecs of Central America were building their massive basalt heads. On the other end of the time frame, the cave could be as old as the most basic hominid culture and rituals, dating back to the era when homo erectus still roamed the younger Earth and homo sapiens had not yet emerged. Each drop leaves its fine layer of calcite, growing with the patience of immortality. With a droplet, we have modern humans. Another drop, and ancient Egypt, Greece, and Rome, flicker and flare and fade. Another, and another, and modern saviors are born; they live and they die; and there are wars, always wars, but there is also life, and joy, and hope. And at the end of it all, there is a column, and it holds the whole of human history.